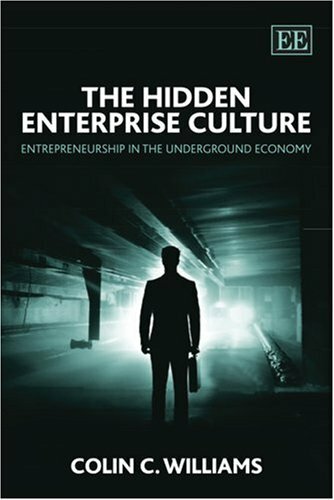 Hidden Enterprise Culture: 9781845425203 Hardcover - LIMEROCK BOOKS INC. In contrast to much of the previous literature that views the underground economy as low-paid, exploitative sweatshop work that should be deterred, this book takes a fresh, more positive perspective that considers the underground economy as a hidden enterprise culture. Colin C. Williams prescribes the means by which western governments can best harness this hidden culture of enterprise. He outlines detailed policy initiatives that seek to assist business ventures in setting up on a formal footing, and aim to encourage underground enterprises and entrepreneurs to make the transition into the realm of legitimacy. This book provides a lucid guide as to how the hidden culture of enterprise can be brought into the open. As such, it will prove invaluable to a wide-ranging audience including scholars and students of business studies, entrepreneurship, management, economics and regional science.